H aving trashed the economies of former socialist Eastern Europe, big business is everywhere taking maximum advantage of the opportunity to super-exploit the resulting flood of impoverished itinerant workers across Western Europe. A recent BBC report highlighted one such scandal involving IKEA’s supply chain, reporting that although “EU rules state that a driver posted temporarily away from home should be guaranteed the host nation’s minimum rates of pay and conditions… companies can exploit loopholes in the law” – and regularly do. The report cites the example of a Romanian driver hired by a Slovak subsidiary of a Norwegian company paying him the Slovak rate of pay for all the driving he does in the West. For his efforts he earns on average about £420 a month, a fraction of the equivalent West European wage. 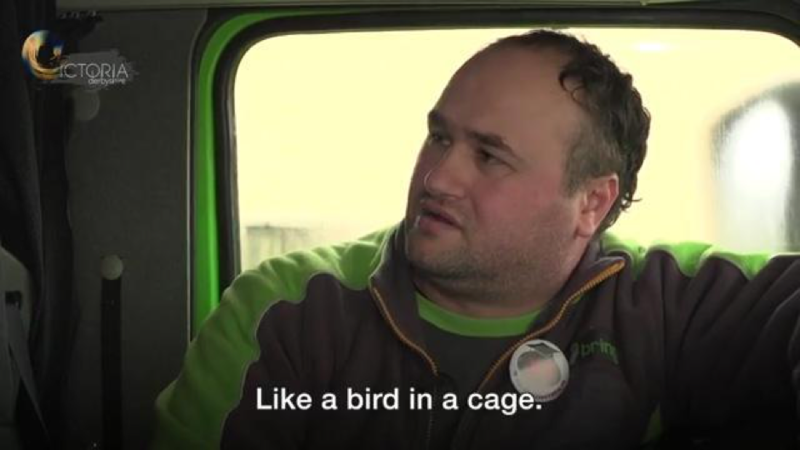 He had to sleep permanently in his cab as he couldn’t afford a hotel, and cooked and ate in the road, describing himself as “a bird in a cage”. Needless to say, IKEA feigns ignorance of what goes on in its own supply chain. But as Dutch transport union FNV told the reporter, IKEA knows damn well who is shifting their merchandise. “The Ukrainian, Moldovan, Polish guys remove the furniture from Ikea, they touch the furniture. Ikea is the economic employer of all these workers here. They have so much power. Ikea has the tool in hand to change the business model with an eye blink” (Zoe Conway, ‘Ikea drivers living in trucks for months’, BBC, 15 March 2017).